Directions: Preheat grill to medium heat. Then, roll out the pizza dough on a flat surface. Using a small bowl or wide mouthed glass, cut the dough into small circles to make the mini pizzas. Roll leftover dough pieces together, flatten and repeat cutting into small circular cutouts. Brush both sides of the dough with olive oil. Make sure your grill has been sprayed with non stick spray. Grill the dough until grate marks appear, about 5 minutes. 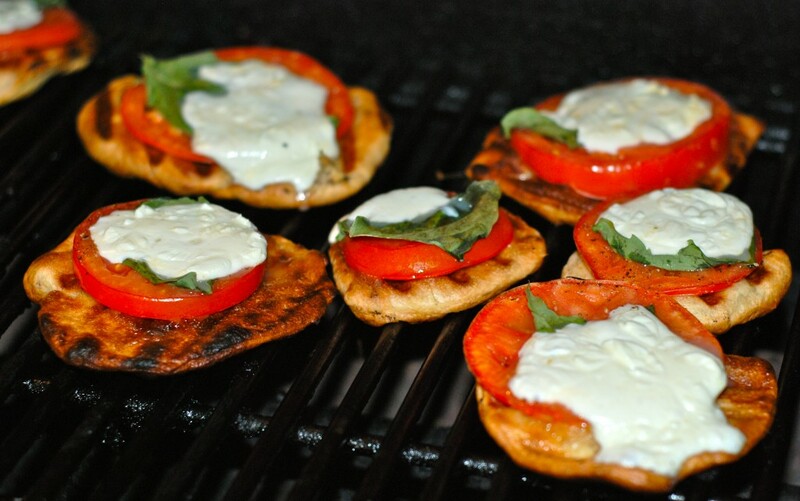 Flip the dough, then, with recently grilled side up, add tomato slices, a piece of basil, and the mozzarella. Grill for 5 minutes or until cheese has melted. This recipe can easily be adapted for meatlovers with the addition of cappicola or pepperoni. Robyn Lindars, aka “The Grill Girl”, writes about BBQ and Grilling on her site Grill Grrrl and hosts Womens Grilling Clinics to encourage women to learn the art of grilling. Previous Previous post: HOT Yoga Fireside! Next Next post: Pellet or Wood Stoves for Greener Homes!